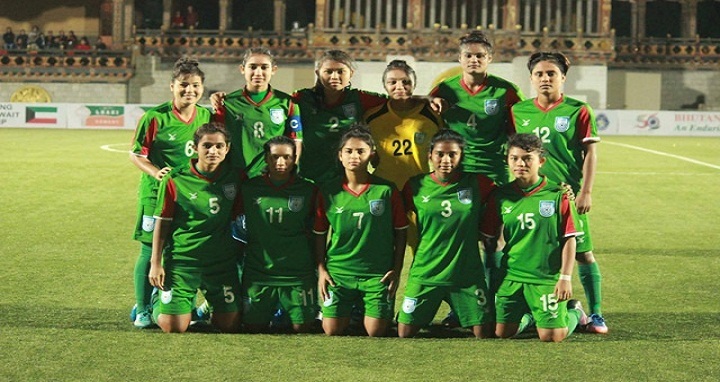 Dhaka, 6 October, Abnews: Bangladesh U-18 national women’s football team continued their impressive form to reach final of the SAFF U-18 Women’s Championship in style when they blanked host Bhutan by 4-0 goals in the second semis held on Friday at Changlimithang Stadium in Thimphu, Bhutan. Bangladesh will now face Nepal in the title deciding final of the championship after the third place deciding match between India and Bhutan scheduled to be held on Sunday at the same venue. In the day’s match, Sanjida Akter put Bangladesh ahead early in the 2nd minute while Mishrat Jahan Moushumi doubled the lead in the injury time of the first half. After the lemon break, Krishna Rani Saker scored the third goal for Bangladesh in the 60th minute while Shamsunnahar sealed the victory scoring the fourth goal for the girls in red and green in the 86th minute from a penalty. Meanwhile, in the day’s first semifinal held at the same venue, Nepal beat India by 3-1 on penalties to enter the final. Both teams played 1-1 draw in regulation as well as extra time before inviting a spot kick battle. Nepal goalie Anjana Rana Magar played a fantastic game as he blocked three spot kicks and even scored one to lead Nepal to a memorable victory. Earlier, Bangladesh rode on Mossammat Sirat Jahan double hat-tricks with seven goals, crushed Pakistan by 17-0 goals in their group opening match and inflicted a 2-1 goals defeat on Nepal to emerge group top in their second group match. On the other hand, Bhutan suffered a 0-4 goals defeat to India in their group opening match but bounced back in the tournament with a crushing 13-0 goals victory over the Maldives to finish group A runners up.